Although I sat in the student section in college, I could not escape section 8. When I competed for four years with the University of Michigan rowing team, we used to meet at the stadium to run up and down the steps of the stadium several times a year. We started and finished our grueling lap around the stadium at section 8. When I struggled to make it up the last few rows of the lap towards my dad's seats, I felt like I was the only one on the team who was coming home. This year, my dad's tickets went unused for a few games when he couldn't sell them or give them away. He couldn't attend because he was fighting a losing battle with leukemia. I could have used the tickets for a few games, but I chose to watch the games by my dad's side in the hospital rather than sit in the stadium without him. 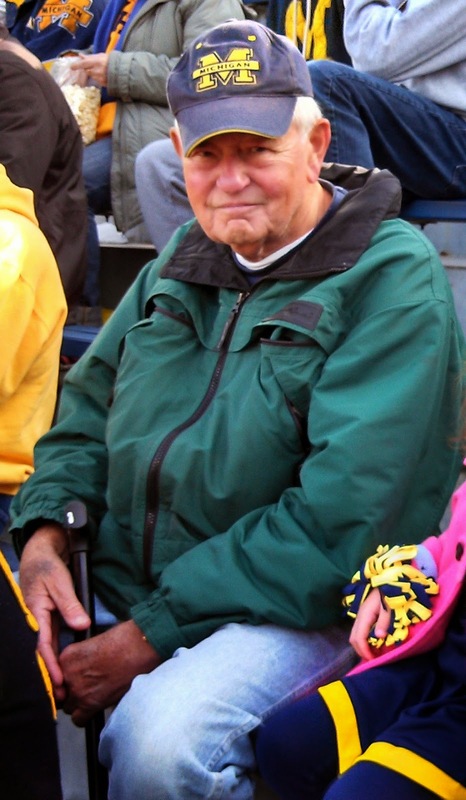 My dad at one of his last Michigan games. 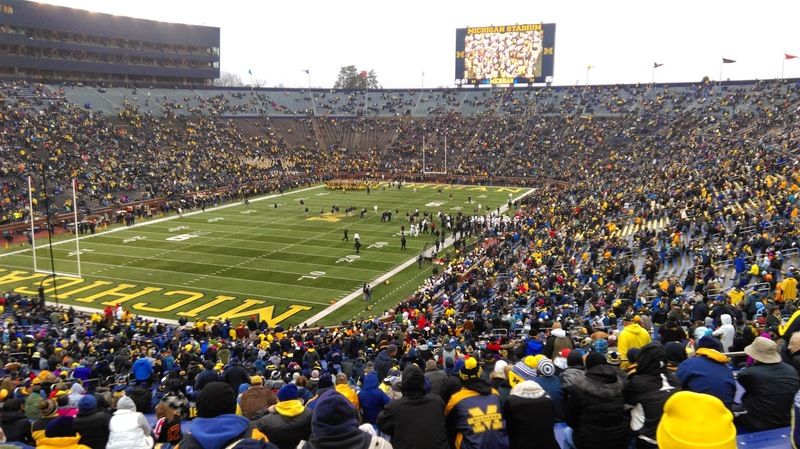 After my dad passed away, I had the opportunity to see Michigan's last home game of the year against Maryland. It was another ugly loss during an even uglier season, but the bright spot was talking to the man who had season tickets in front of my dad's seats for as long as I can remember, and probably longer than that. He talked about what a good man my dad was, and he sincerely was saddened to hear that my dad had died. This man had sat in front of my dad when Bo and Woody were screaming at refs from the sideline and Bob Ufer was screaming in the press box, when Michigan lost heartbreakers like the Hail Mary loss to Colorado, when Jimmy Harbaugh threw a 77-yard bomb to John Kolesar to beat Ohio State, when Anthony Carter beat Indiana and infuriated Lee Corso, when Desmond Howard and later Charles Woodson returned punts against Ohio State and sealed their places as Heisman winners, and when countless Michigan players walked off the field holding roses. Our stadium neighbor and my dad had probably sat in those same seats watching three-hour or longer games more than 200 times. Together they sat in devotion to the same cause, devotion to the same university. Michigan Stadium has changed over the years. We have piped in music, luxury suites, and video scoreboards, but the marching band, the players on the field, and the lifelong fans like my dad are the constants that hold together the traditions at a place like Michigan. As it became clear that Michigan was going to hire Jim Harbaugh and as I watched his press conference, the only thing I wanted to do was talk to my dad. My dad would have been excited about the hire. We would have talked about Harbaugh's guaranteed, and delivered, victory over Ohio State as a player. We would have talked about his fantastic jobs rebuilding the three previous teams he coached. We would cautiously talk about how Michigan might become an elite team again even though OSU and MSU have damn fine coaches themselves. But my dad is gone, and I can only imagine what he would say today. 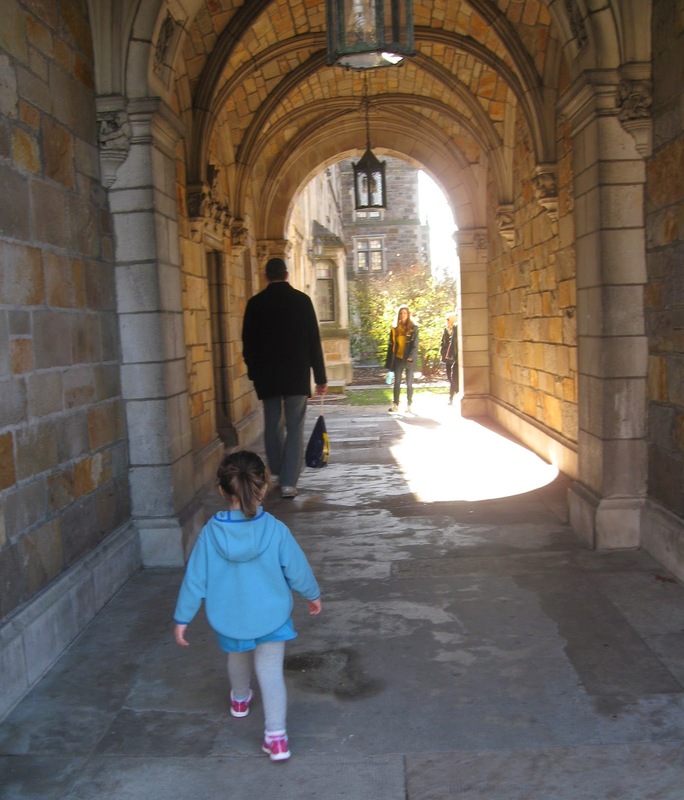 My oldest daughter on campus when she was three. Indoctrination at work! As Bo Schembechler once said, pro athletes play for a contract, but Michigan football players (and I would add most college athletes) play for the Team. For true college football fans, it's about the team, too. It's about watching young kids grow up before our eyes. It's about kids choosing to play for your team instead of being drafted or traded to play for it. It's about the walk-on with a bum knee becoming a starter, then a captain, then team MVP, then eventually making an NFL roster. It's about homecoming, the fight songs, visiting your favorite restaurant on campus after the game, and indoctrinating your own children in the religion of your alma mater. My dad believed this, and perhaps Jim Harbaugh believes this too, for he was a fan of Michigan football long before he played for Michigan or coached in the NFL. So the NFL insiders have it wrong. The question isn't: Why would Jim Harbaugh return to Michigan? The question is: Why wouldn't a guy who grew up the son of a Michigan assistant coach and who played for and idolized Bo Schembechler return to Michigan--to a fanbase that believes in him, to his childhood home, to family?